At the recent Assembly Oakhill College proudly celebrated the significant success of many students in various competitions with over 150 students crossing the stage. Nine Oakhill College students under Team Leader Adam Taras (Yr 12) are approaching the final of the MIT International Zero Robotics Competition hosted by Sydney University. 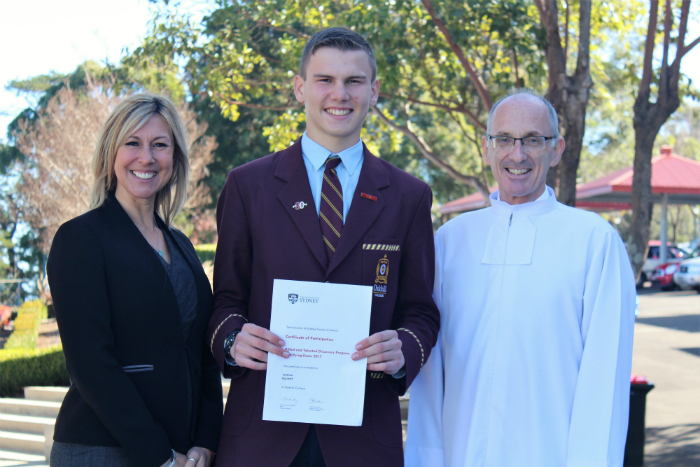 Joshua Wilkinson (Yr 11) was selected from applicants across Australia for the International Science School at the University of Sydney held in the July school holidays. Seventeen Year 7 and 8 students achieved Distinction or High Distinction in the Big Science Competition organised by the Australian Science Innovators. Forty-Seven Year 10 and Year 11 students are in the final stages of the Australian Science Olympiad hosted by the Australian Science Innovators. Thirty Year 10 students are in the final stages of the Science and Engineering Competition hosted by the University of Newcastle. 18 Year 10 students have enrolled in the Big History Macquarie University Course which gives 3 bonus ATAR points which can be used when applying for a degree at Macquarie University. The students are: William Eisenhuth, Thomas Pratt, Craig Lovemore, Christian Brayan, Lachlan Judd, Luke Duncan, Rory Goggins, Matthew Todesco, Jack Mayhew, Jesse Krauksts-Garofano, Joshua Cavallo, Thomas Cunningham, Rowell Fabian, John Aban, Lucas Goosens, Thomas Rakuljic, Thomas Smethurst, and Johannes Lilischkis. On Tuesday 25th July 3017, five Year 10 Boys (Isaac Johnston, John Aban, Lachlan Smith, Michael Ireland and Adrian Moat) will be participating in the Macquarie University Cyber Security Challenge. In the recent Year 10 Allwell assessment 12 Oakhill College boys progressed more than two Stanines which is highly significant progress above the norm, with Lachlan Elliott achieving Stanine 9, the top Band, in all assessments a perfect score. Computing Teacher, Mr Tosic, is working with a number of Oakhill College students on a number of academic projects STEM Programming Camp, STEM Robotics Camp, Games & App Club (Year 7 & 8).